Need a better alternative to TeamViewer? Splashtop is a better solution for IT, MSPs, and Support teams and can save you up to 90% off your cost. We just published out Best TeamViewer Alternative for 2019 post. You can read that here! TeamViewer might seem like the remote access/remote support tool that you need, but today there are better alternatives that are designed for your specific use cases and cost much less than TeamViewer’s commerical plans. This is why Splashtop is consistently mentioned as a better alternative to TeamViewer. Splashtop has several solutions and packages based on specific use cases. This ensures that the Splashtop solution you get has everything you need, but at a much lower price. Splashtop solutions are designed around whether you’re looking to remotely access your computers, or if you’re looking to support others’ computers and devices remotely. Splashtop is also a great choice if you want to provide remote support, whether it will primarily be attended or unattended support. Creating these solutions for specific use cases has given Splashtop an advantage in providing exactly the right product at a much better price. In fact, remote support users who switch from TeamViewer to Splashtop can save 50% guaranteed. When you’re looking to keep your costs low, those savings definitely go a long way. You won’t have to worry about sacrificing performance, security, reliability, or usability when choosing Splashtop over TeamViewer. Splashtop’s remote access engine ensures fast connections with minimal latency. It doesn’t matter how far away from the end-point device you are or what devices/operating systems are being used, Splashtop’s remote connections consistently produce high definition quality in real-time. Splashtop has never had a massive security breach. In addition to having the most secure remote access/remote support solutions, Splashtop is compliant with HIPAA, GDPR, PCI, SOC 2, and other industry standards and regulations. Do you rely on features like mobile device support, file transferring, remote reboot, user management, and logging? Each of our Splashtop packages comes equipped with the top features you need. If you’re looking to make the switch from TeamViewer to Splashtop, you’re not going to miss a thing. To see our full Splashtop vs. TeamViewer comparison, click here. You’ll need to think of your use case to determine which Splashtop product is your best TeamViewer alternative. Below are the primary use cases of remote access and remote support, and which Splashtop product is the better alternative. Splashtop Business Access is the best alternative to TeamViewer. With the Splashtop Business app, you can remotely access and control your Windows and Mac computers. You can access them from any computer, tablet, or mobile device running on Windows, Mac, Android, or iOS. So why is Splashtop Business Access better than TeamViewer? It costs less, a lot less in fact. Splashtop Business Access starts at $5/month per user, while TeamViewer is $49/month per user*. That’s a 90% saving! With Splashtop Business Access, you’ll have secure access to your computers, and access to top features like file transferring and remote printing. Splashtop SOS+10 and SOS Unlimited are your best TeamViewer replacement options. These two Splashtop packages are ideal because they give you the ability to provide both attended and unattended support. Again, cost is a big reason why Splashtop is better than TeamViewer. Splashtop SOS+ and SOS Unlimited only cost $19/month and $34/month (respectively) per concurrent technician per year. On the other hand, TeamViewer can run anywhere from $49/month to $199/month*. Plus you have to pay an extra $33/month for mobile device support, and $99/month for concurrent users. This makes Splashtop a much cheaper alternative. Other Splashtop advantages include being able to have 10 concurrent sessions per technician (only 3 with TeamViewer) and being able to access unlimited unattended computers with SOS Unlimited (only 200 with TeamViewer). Plus, Splashtop includes all the top features in TeamViewer such as file transfer, remote print, chat, and user management. The killer-feature is definitely the live screen viewing with AirPlay on iOS. A lot of my customers use iPhones and iPads and with TeamViewer I never could really help, because the user wasn’t able to explain what he/she saw. Now I can see it too. The ability to remote control Android devices is a deluxe bonus. — Lars M. Schreiber, L’AVENIR e.K. Lower cost, feature list, and high performance are the reasons most commonly mentioned when customers tell us why they prefer Splashtop over TeamViewer. Interested in trying Splashtop? 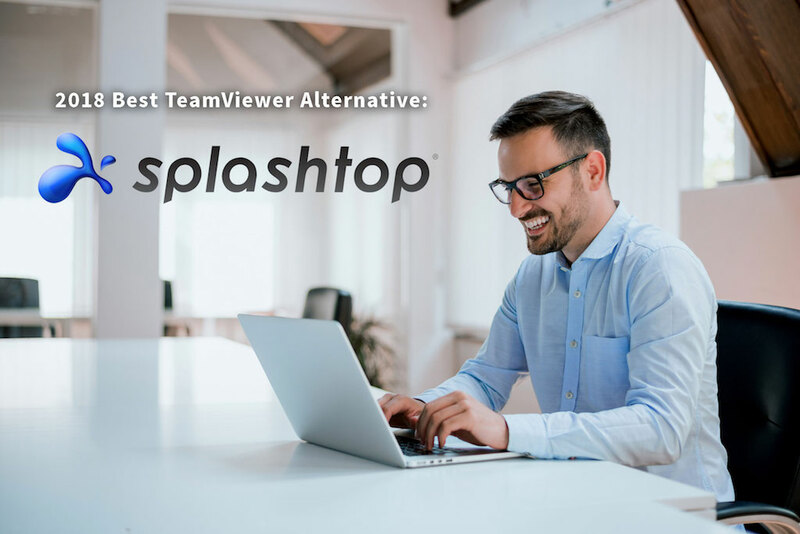 Find out for yourself why so many others say Splashtop is the best TeamViewer alternative and try it now for free. For individuals and business professionals who want to remotely access their computers. For MSPs and IT/Support professionals who want to provide remote support on users’/customers’ devices.